Two Italian posters for Agatha Christie adaptations, both making prominent use of yellow and a red circle (or a rote kreis, to mention the title of a krimi). I could well imagine the centre section of each poster being a paperback cover. Robert Hampton as an actor, and not an alias for director Riccardo Freda? Face mirrored on blade more like Four Flies on Grey Velvet? Saw on Ebay as a poster for The Bird with the Crystal Plumage. Carlo Rambaldi, the special effects expert who is most famous for creating ET, but who also worked with Argento in Deep Red and Fulci in A Lizard in a Woman's Skin amongst others has died. My favourite example of his work comes from the Fulci film, in the form of the Francis Bacon-style vivisected dogs. 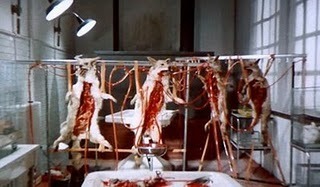 Rambaldi and Fulci reputedly had to produce the effect in court to show that they had not used real animals.